Since you have not posted a screenshot, my best guess is that you have opted (perhaps accidentally) to "ignore" one or more tags. In the screenshot below, I have "ignored" the [abstract algebra] tag (note the box on the bottom right labeled "Ignored Tags"). 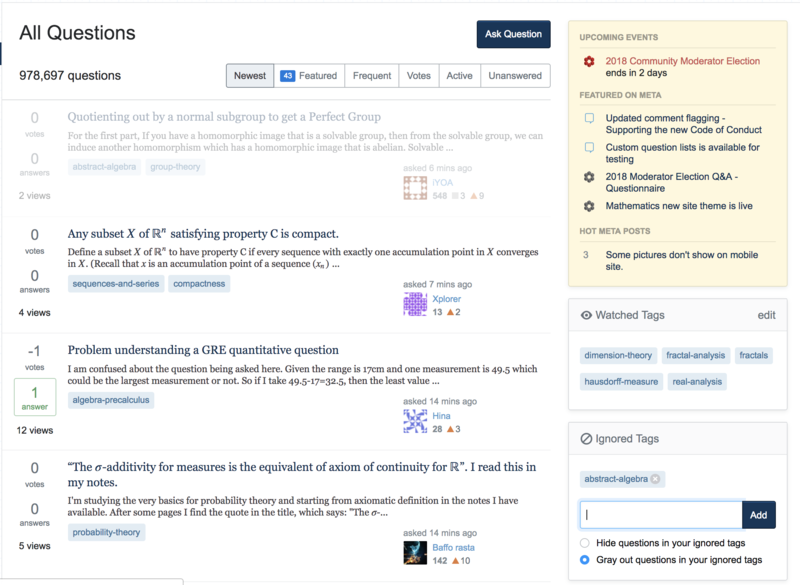 This means that any post tagged with [abstract algebra] will be greyed out (see the first question in the queue). If this is what is going on and you want it to stop, hit the "edit" link in the "Ignored Tags" box (see below), and stop ignoring whatever tag is causing things to be greyed out. Alternatively, hit the "edit" link and hide all questions with the ignored tag (then you won't see them at all, so the greyed-out questions won't clutter your feed).